A massive storm has been lashing the Arctic, and its fury is so great that it's actually breaking up the remaining ice at the pole and whipping it into a substance that one scientist called "slushy." Over at the awesome DotEarth blog, Andrew Revkin has been keeping tabs on the storm, which is incredibly unusual for this time of year. 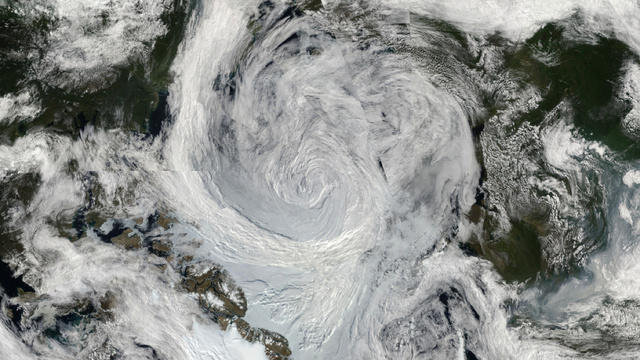 Summers in the Arctic are generally quite mild, but this season has been an especially stormy one. Here you can see an amazing stop-motion video taken from two cameras watching the Arctic ice during July and early August. Note that the storms are slowly moving the ice around. Low pressure systems tend to cause a divergence or spreading out of the ice pack (high pressure systems in contrast, cause convergence and compaction). The sea ice cover this summer was already very spread out. Much more of the Arctic ocean was comprised of individual broken ice floes and the pack ice had holes in it exposing ocean in many places. This storm should cause even more of that, especially in the far north where that storm will sit for a few days. To stay with the tea analogy, instead of a cup of iced tea with solid cubes floating on the surface, the storm will churn the tea into a more slushy consistency. Though Chapman isn't sounding the alarm about this storm being a major cause of melting in the Arctic this season, he notes that it could cause some melt. The exposed open water caused by the wind divergence may absorb some additional sunlight and melt more ice than usual over the next few weeks (see NASA video on temperature-albedo feedback), but given that the sun is well on its way to setting for the winter, I think this effect will be fairly minimal.